Meatballs in a Tomato Ricotta Sauce Thyme for Cooking healthy gourmet. Almost a skillet dinner - the meatballs are cooked in the sauce but the pasta is cooked separately. The ricotta is stirred into the sauce making it creamy - if a bit pale. In medium bowl combine egg, bread crumbs, mustard, ketchup, Worcestershire sauce and oregano. Mix well. Add beef and mix well, hands work best, kneading it like bread dough. Form into small meatballs, about 1" (2.5cm) in diameter. Open tomatoes, roughly chop, reserving all sauce. Rinse beans if needed, drain. Heat a large skillet over medium heat. When hot, add oil, paprika, chili powder and sauté briefly. Add onion, pepper, garlic and sauté until onion is transparent, about 5 minutes. Add the tomatoes, juices and stir to combine. When simmering, add the meatballs, being careful that they don't touch. 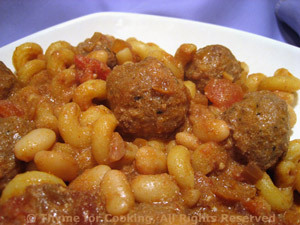 Cover, reduce heat and continue to simmer until done, stirring and turning the meatballs once or twice, about 10 minutes. Add ricotta, stirring well to combine. Add beans, cover and heat through. Add pasta, stir well and serve.